Meredith Z. Avakian-Hardaway (third from left) with the Temple PRSSA Executive Board at Careers 101. 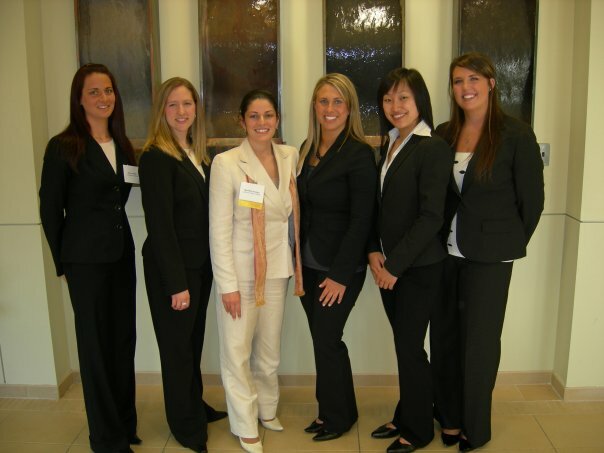 One decade ago, I jumped on the Broad Street Line with several other members of our PRSSA “e-board” and left Temple University’s Main Campus to attend PPRA’s Careers 101 event for students and young professionals. If any of us doubted whether we picked the right [PR] major, Careers 101 somehow miraculously assured us that we had in fact made the right decision to go into this fast-paced and ever-changing field of writing, creativity and grit. We wanted to share this experience with dozens of our classmates. Therefore, on behalf of our PRSSA chapter, I emailed PPRA Executive Director Denise Downing and, should the event ever be held again, offered to host it at Temple University. Not only was the event brought to Temple, it remained there for three years before moving to PECO for another three years. Then, after speaking at a Drexel PRSSA meeting, their chapter reached out to me and offered to host the event. Needless to say, the event then went to Drexel, where it was held for two years. Now, the 10th Annual Careers 101 will be held at The Liacouras Center at Temple University, where my career started a decade ago partially as a result of this wonderful event. As such, I have participated in the event every year since its inception, as an attendee, PRSSA president, College Relations Committee chair, panelist, networking volunteer, resume critique volunteer and now in my capacity as president-elect. It has been an honor and pleasure to watch this event grow and flourish. Each year there is a different angle or twist. This year, in honor of Careers 101’s 10th anniversary and PPRA’s 70th anniversary, the panelists are all past presidents of PPRA and are some of the top PR pros in Philadelphia and beyond. PPRA’s College Relations Committee has worked hard to put together a thoughtful program that somehow adds an element to one-up years passed. Over the years, thanks to the honest feedback of the students and young professionals, as well as input from past panelists and university/college faculty and professors who have supported the event, changes have been made to improve the event for anyone involved. For example, in its first year, there were only a handful of professionals in attendance, which resulted in a half hour wait for students to get their turn to talk with them. Event attendees can now expect to network with up to a few dozen professionals in attendance. The Committee wanted to come up with something else new and special for the 10th Careers 101, so this year’s attendees can look forward to getting their professional headshots taken for their LinkedIn profiles. Also, a number of PR professionals are raffling off their time for shadow days, networking lunches and informational interviews. The access to high-caliber professionals is a tremendous value to students and young professionals alike. Of course, what’s Careers 101 without a resume critique? That must-have bonus will be available again this year. If you are a student or young professional considering going into PR, this event is for you. Your path to internships, mentors, professional contacts and maybe even employment opportunities, it all starts here. If you are a PR professional and you have interns and/or young employees, this is an event they will benefit from…and where you might be able to find your next interns! Additionally, I would be remiss if I did not mention the 2015 Dr. Jean Brodey Student Achievement Award. This award honors a college junior or senior who has exhibited outstanding professional promise in the field of public relations, has an excellent academic track record and contributes to his or her community. Any PPRA member or internship supervisor in the Philadelphia region may submit nominations for the award. Self-nominations are welcome. The winner receives a commemorative plaque and a $250 cash prize. See you at Careers 101 on April 1! Remember, your career is no joke. Meredith Z. Avakian-Hardaway is President-Elect of the Philadelphia Public Relations Association and Director of Communications and Marketing at the Philadelphia Bar Association. Follow Meredith @MZApoetry on Twitter and connect on LinkedIn at https://www.linkedin.com/in/meredithavakian. This entry was posted in Current Events, Events and tagged Career, Careers 101, College Relations, College Students, Current Events, Events, Greater Philadelphia, Philadelphia, PR, PR Pro, PRSSA, Public Relations, Young Professionals by pprablog. Bookmark the permalink.